Configure conditional access to Office 365 services for PCs managed by Configuration Manager. For information on configuring conditional access for devices enrolled and managed by Microsoft Intune, see Manage access to services in System Center Configuration Manager. That article also covers devices that are domain joined and not evaluated for compliance. For Windows Servers that may have multiple users signed in simultaneously, deploy the same conditional access policies to all of these users. To set up conditional access, you must first create a compliance policy and configure conditional access policy. When you configure conditional access policies for PCs, you can require that the PCs be compliant in order to access Exchange Online and SharePoint Online services. ADFS Sync, and an Office 365 subscription. The Office 365 subscription is for setting up Exchange Online and SharePoint Online. A Microsoft Intune Subscription. The Microsoft Intune Subscription should be configured in Configuration Manager Console. The Intune subscription is used to relay device compliance state to Azure Active Directory and for user licensing. You can register PCs with Azure AD through the compliance policy. For Windows 8.1 and Windows 10 PCs, you can use an Active Directory Group Policy to configure your devices to register automatically with Azure AD. o For Windows 7 PCs, you must deploy the device registration software package to your Windows 7 PC through System Center Configuration Manager. The Automatic device registration with Azure Active Directory for Windows Domain-Joined Devices article has more details. Must use Office 2013 or Office 2016 with modern authentication enabled. All required updates installed with a deadline older than a certain number of days: Specify the value for the grace period from the deployment deadline for required updates on the user's device. Adding this rule also automatically installs any pending required updates. Specify the required updates in the Required automatic updates rule. Require BitLocker drive encryption: This rule checks if the primary drive (for example, C:\) on the device is BitLocker encrypted. If BitLocker encryption is not enabled on the primary device, access to email and SharePoint services is blocked. Require Antimalware: This rule checks if System Center Endpoint Protection or Windows Defender is enabled and running. If it is not enabled, access to email and SharePoint services is blocked. Reported as healthy by Health Attestation Service: This condition includes four subrules to check the device compliance against the device health attestation service. For more information, see Health attestation. The conditional access criteria for device health attestation was first introduced in version 1710 as a pre-release feature. Beginning with version 1802, this feature is no longer a pre-release feature. 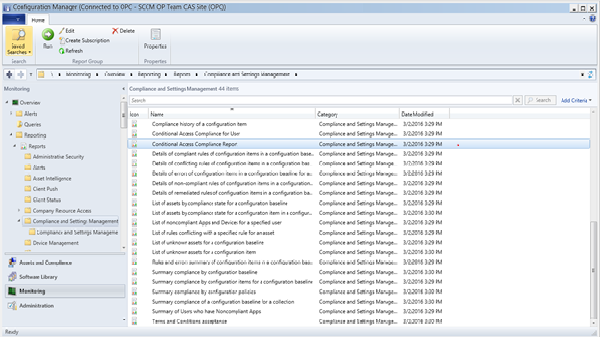 Run the Conditional Access Compliance Report. It can be found in Monitoring workspace under Reports > Compliance and Settings Management. This report displays the compliance status for all devices. Devices reporting as not compliant are blocked from accessing Exchange Online and SharePoint Online. You target conditional access policies to groups of users depending on the policy types. These groups contain the users that the policy targets, or exempt from the policy. When a policy targets a user, each device they use must be compliant in order to access the service. Active Directory security user groups. These user groups should be synchronized to Azure Active Directory. You can also configure these groups in the Microsoft 365 admin center, or the Intune account portal. Targeted groups - User groups to which the policy is applied. The same group should be used both for compliance and conditional access policy. Exempted groups - User groups that are exempt from the policy (optional). If a user is in both, they are exempt from the policy. Only the groups, which are targeted by the conditional access policy, are evaluated. To create a policy for Exchange Online, select Enable conditional access policy for Exchange Online. To create a policy for SharePoint Online, select Enable conditional access policy for Exchange Online. On the Home tab, in the Links group, click Configure Conditional Access Policy in the Intune Console. You might need to supply the user name and password of the account used to connect Configuration Manager with Intune. The Intune admin console opens. For Exchange Online, in the Microsoft Intune administration console, click Policy > Conditional Access > Exchange Online Policy. For SharePoint Online, in the Microsoft Intune administration console, click Policy > Conditional Access > SharePoint Online Policy. Set the Windows PC requirement toDevices must be compliant option. Under Targeted Groups, click Modify to select the Azure Active Directory security groups to which the policy applies. The same security user group should be used for deploying compliancy policy and the Targeted Group for conditional access policy. Under Exempted Groups, optionally, click Modify to select the Azure Active Directory security groups that are exempt from this policy. Users view compliance information in Software Center. When blocked due to noncompliance, initiate a new policy evaluation after remediating compliance issues.